Yesterday, the Welfare Association of Kidney Patients, Hyderabad organized a one day picnic to Nagarjunasagar for kidney patients of the city. It was an excellent initiative that aimed to create awareness of kidney disease and the risk factors so that people could avoid it in the first place. 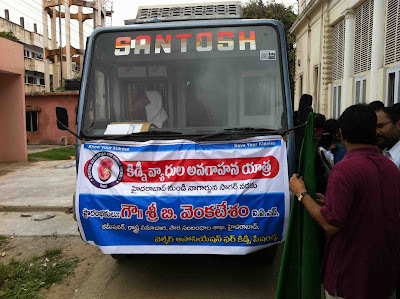 The group planned to stop at various villages and towns on the way to Nagarjunasagar and distribute pamphlets and explain to the general public about this disease and how it can be avoided. Mamatha, who spearheads this association is on dialysis for the last 12 years. She is a highly energetic lady with great passion for this cause. She called me to accompany the group as well but I could not go due to some other commitments. I plan to go the next time for sure. Before the flagging off, there was a small gathering where the Commissioner, Information and Public Relations, Govt. of Andhra Pradesh, Mr. Venkatesam, spoke to the gathering. I was asked to speak as well. I was wondering what to say. I ended up making an appeal to the Commissioner to abolish import duties on life saving drugs and to increase the exemption limit under section 80 DDB that allows people with chronic conditions to claim an exemption up to Rs. 50,000 per year. This amount is a bloody joke. I spend more than that in two months on my medical expenses. Looking back, however, I feel I should have addressed the dialysis patients rather than the Commissioner. I am sure nothing is going to happen on the government front for decades. However, a small message to dialysis patients could have set them thinking about how they can lead normal lives on dialysis. 1. Get as much dialysis as your money permits: With dialysis, without doubt, more the better. In fact, co-incidentally, Dr. Ashwin Aiyangar has blogged about this recently. So, let only your financial resources limit the amount of dialysis. The more dialysis you get, the better your blood counts, the less severe your co-morbidities, the more active your life. 2. Exercise: Even if it means just a little bit. But move about. Do as much as your physical condition permits you. Of course, talk to your doctor first. But even a little exercise helps not only your body but your mind as well. 3. Work: If you are able to, work. Even if it is only part time. For one, it takes your mind off the medical problem. It gives you tremendous amount of self-confidence. Your sense of self-worth improves. And, heck, whatever money you make can help you pay your dialysis bills! Please don't show your frustration in your words. I don't expect that from you..
What was corrected ? Why cannot Kamal show frustrations ? Just enjoy his genius in writing. Don't worry about damn comment dude B. I think he should write a book and get rich and sponsor few people to pay f***ing bills. Thanks so much for that comment! You really made my day! Now please do one thing, let me know who you are so that I can come and thank you in person!